Frances (Fanny) Henstock was born 1804 at Heage, to parents William Henstock (a farmer) and Ellen Smith. She was baptised at Pentrich on 7 April 1805. Her parents had at least 11 children, but may have had many more. The Parish of Pentrich was an important centre, more important than nearby Ripley. The Church of St. Matthew was built in c.1150, close to the site of a Saxon cross, which stood in what is now the junction of Asher Lane and Main Road. Carved Saxon stones can still be seen in the church. In 1662 Non-conformism came to Pentrich. The old Congregational Chapel, was built then by the Reverend Porter, a former Vicar of Pentrich whom had been ejected, due to his beliefs. The Church was used from 1700 onwards, most recently by the United Free Church Methodists. At the time of her birth George III was King. George III married Charlotte of Mecklenburg-Strelitz in 1761 to whom he was devoted. The couple had fifteen children, nine sons and six daughters. At Windsor, he excavated the Royal Tomb House under the Albert Memorial Chapel and commenced a number of restorations which were to be completed by his son, George IV. George III suffered from porphyria, a debilitating disease which affected him as early as 1765 and throughout the last years of his reign. George III died blind, deaf and mad at Windsor Castle on January 29, 1820. Fanny had her first child out of wedlock, with Joseph being baptised on 3 May 1829 at Heage. Later that month on 26 May 1829 Timothy Cartwright married Fanny Henstock at Duffield, Derby’s, as Heage Church was not registered to perform marriages until around the 1850s. The couple set up home at Heage, Derby’s. In 1831 their son Elijah was born, followed by Sarah (1833), Eliza (1835), William (1836), and Ellen (1839). At the time of the 1841 census Timothy was employed as a labourer. In 1842 daughter Harriet was born followed by Titus in 1845. By 1851 they had moved to Black House, Heage and Timothy had taken up work as an engineer on a coal site. They stayed in the Heage area, until the late 1860s when they moved to Ripley. Fanny died November 1873, age 68 and was buried at Heage. Eliza was baptised at Belper methodist church and possibly born in Duffield. She married Thomas Webster in 1833 at Duffield. They had children Daniel, Josh and James. I have no trace of the family after the 1841 census. Baptised at Belper in 1815, thought to be living with the family in 1841 at South Wingfield, Derbys. No further trace. Living at South Wingfield at the time of the 1841 census, working as a butcher. No trace after this census. Baptised at Belper Methodist Church in 1820, he worked as a Sadler at the time of the 1841 Census (lived at South Wingfield). He is thought to have married Eliza Wilmott in 1845. In 1849 he is possibly working as a clerk on Saltergate in Sheffield (Wrights 1849 Directory). He then disapears from the census returns until the 1880s, when he is married to Hannah Wood Henstock and living in Darley Dale. In the 1891 census return he is listed as a retired carrier. Baptised at Heage in 1823. William Henstock was born in Derbyshire about 1776 (exact location not known). Ellen Smith was born in Salterwood, Ripley, Derbyshire about 1786. During the Saxon and medieval times, the sixteen families who lived in the two hamlets (Ripley and Pentrich), worked the fields together, sharing grazing land and haymaking. During the 12th and 13th centuries many grants of land were made to the church and Ripley and Pentrich were given to the Abbey of Darley. Thus, for some centuries, they grew and prospered under the benevolent care of the Church. The Abbot was responsible for collecting the feudal dues imposed by the King and the tithes which increased the riches of the Abbey. Their charters in the British Museum, teem with references to Paddel(Padley), the field of Lowes (Lowes Hill), Botleyam (Butterley), Witeleg (Whiteley), Salterwode (Salter Wood) and Herthay (Hartshay). William Henstock married Ellen Smith at Pentrich on 24 JUN 1799. They went on to have at least 9 children (possibly many more) between 1803 and 1830. During this time they appeared to move around Derbyshire, having children baptised in Pentrich, Duffield, Belper, South Wingfield, and Heage. 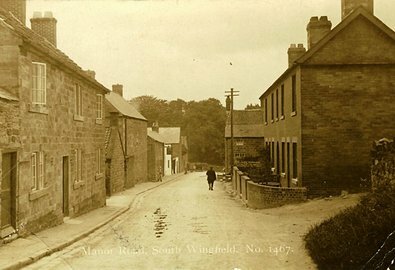 At the time of the 1841 Census they lived at South Wingfield, where William worked as a farmer. I believe William died between 1847 and 1850. 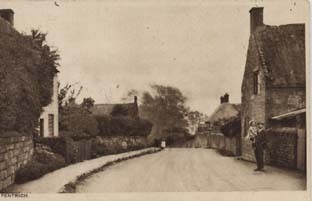 Following the death of her husband, Ellen went to live withn her daughter Ellen and her husband Samuel Powley in Whittlesey. The 1851 census shows them with Samuel Powley a master brick layer and maker. Samuel died in the 1850s and Ellen (senior and junior) returned to Derbyshire, Ellen Powley then married Thomas Eggleston a domestic gardener from Newark. Ellen (senior) was living with them in Wingfield area of Derbyshire when the 1861 census was taken. Sarah Morrell was born 1780 in the Duffield area to parents Mathew and Mary Morrell. 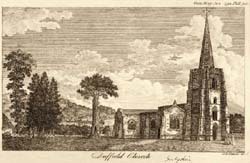 She was baptised at Duffield on 5 March 1780. The main occupation of the villager’s of Duffield was the making of silk-hose and gloves, and the most familiar sound one heard in going about the streets was the screech of the shuttles and the clang of the hand-looms, which were worked in all parts of the village. 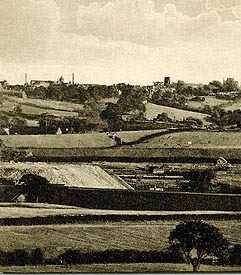 The stone quarries on Duffield Bank and Little Eaton Bank and Chevin, found work for many men, and men and girls were employed at Peckwash when it became a paper mill. 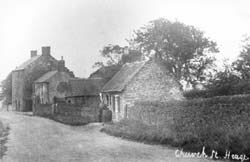 The Post Office, kept by two ladies who might have belonged to "Cranford," was then the little brick cottage which faces the end of Wirksworth Road, and stands next to Mr. Abell's forge. (It is still known as Post Office cottage.) Here a single window pane had been made to open, and if one required stamps, he tapped on the window, and the stamps were handed through. More important business could be transacted at the door, but that was all there was in the shape of a post office . In 1787, Duffield school for boys and girls stood where is now the Duffield Club; afterwards, the present Parish Room was built for a boys' school, and served until the property was bought by the Midland Railway Company. Duffield was noted for its fairs for horses and cattle - one on the first Thursday after New Year's Day, and the other on the first of Marc The White Hart was then a thatched cottage, and in front of it stood an ash tree, around which the village fathers took their "cakes and ale." Street amusements and performances played a much larger part in village life than now, and strolling musicians, tumblers, acrobats, dancing bears, and marionette shows wandered from place to place, and played in the streets. At Christmas-time the old Morris-dancers still came round, and the "guisers" with their fantastic dresses and traditional old-world play, helped to make a merry time. Duffield was much more an agricultural centre at that time. The three mills on the Ecclesburn were all corn-mills. Peckwash was formerly a corn-mill. Three malt-houses were in full work in the village. A gimp mill, behind the house below Mr. Hodgkinson's shop, employed a number of girls; afterwards, the Girls' School was held in the old mill. Nails were made in forges near to the Baptist Chapel. The site of the old village pinfold, or pound, was the piece of land in front of the present Infants' school play-ground, and has since been, filled up. Here horses and cattle found straying were impounded until they were released by the village constable, after payment by the owner of a small fine. Boys used to think it quite an "event" when a horse or a few sheep were locked up in the pin-fold. The couple set up home at Black Horse, Heage, where in 1800 their first child (William) was born, followed by Timothy (1804), Mary (1806), Joyce Morrell (1808), Mathew (1810), Samuel (1812), Elijah (1814) and Titus in 1816. By the 1841 Census Timothy’s occupation was listed as a labourer, from which he supported his wife Sarah. His son’s Samuel and Titus were also living at the family home at Black House, Heage. Sarah died in the mid 1840s.